OroCRM is a Customer Relationship Management software made for businesses who sell online. With available connectors into countless eCommerce platforms, Oro offers a flexible eCommerce CRM that is ready to track all website interactions for better marketing and sales focus! Enable your sales teams to identify and target your most valuable customers by recency, frequency, and total dollar-value of purchases while marketing teams can target customers with abandoned carts. In addition, enable your managers to monitor purchasing funnels and sales pipelines for key operational reports. Connect into Magento, WooCommerce, PrestaShop, or our very own B2B eCommerce platform for a complete eCommerce CRM. Whether your online business is primarily B2C, B2B, or multi-channel, gain a 360° view of your customer across all touchpoints and interactions. We also support integration with popular marketplaces, like eBay and Amazon, for businesses with multiple online sales channels. Be sure to check out the Oro Marketplace for all OroCRM extensions and connectors. Capturing information across every customer interaction and displaying the data in a single customer view enables your business to increase customer satisfaction, improve operation efficiency, and gain business intelligence. Quickly identifying which website pageviews, sales email communications, and outstanding customer support tickets are associated with a specific customer results in an enriched customer experience. Our eCommerce CRM comes with an advanced segmentation engine that can target customers on specific criteria like abandoned carts or multiple product page views. 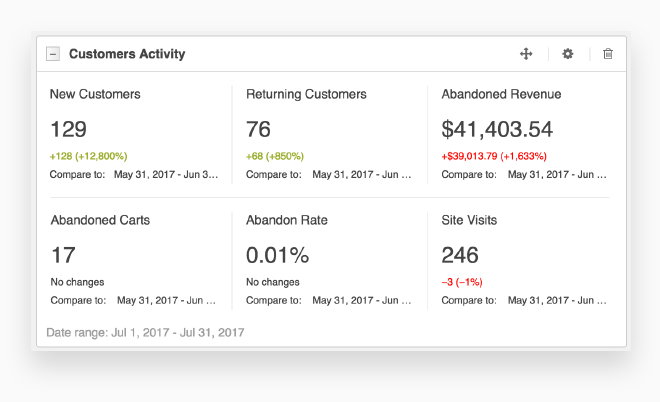 Our eCommerce CRM generates dashboards and reports that track everything from sales pipeline figures to customer website activity all through our intuitive dashboard. Managers are able to customize the dashboard with the most relevant reports and widgets for business intelligence. Other reports on eCommerce data, like overall online revenues, average order value, and orders over time, are also offered out-of-the-box.